Born on February 9, 1890, in Berlin, Holmes County, Ohio, she was the daughter of Dr. George and Lucinda Zehnder Weiss. In the early 1900s, four women – Lizzie Arlington, Alta Weiss, Lizzie Murphy and Josie Caruso – immersed themselves into men’s professional baseball. The news of their playing would often bring in large crowds so they were seen more as promotional gimmicks instead of serious players. In a time when gender roles were deeply ingrained in the fiber of society, these women’s abilities began to chip away at that barrier. 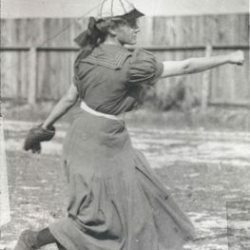 Baseball was a man’s game until a seventeen-year-old girl in a long heavy wool shirt and baseball hat stepped up the pitcher’s mound and struck out numerous players. That girl was Alta Weiss. She was the middle child of three girls, Alta stood out right away. At that age of two, her father once stated that she “hurled a corncob at the family cat with all the follow-through and wrist-snap of a big league pitcher.” Why did she throw it at the cat? Reportedly, she was trying to save a bird the cat had its eye on. Her father, a doctor, saw Alta’s talent and nurtured it. So what does any father do to encourage his young child to continue to enhance their talents? Create a high school. In 1905, Alta’s father established a local high school which allowed her to play on its newly created baseball team. Additionally, he transformed their barn into a gym and created “Weiss Ball Park” so that his daughter would have more opportunity to train and play. Alta’s particular talent was pitching and she soon perfected the fastball, knuckleball, and spitball. Many were skeptical of a girl who could pitch – especially one would that could play at the same level as male players. She proved her abilities during a vacation in Vermilion, Ohio with her two sisters in the summer of 1907. Alta was playing baseball with some local boys when the town’s mayor happened upon it. Seeing her skills he went to Charles Heidloff who was the manager of the semipro Vermilion Independents. The Independents had just lost their starting pitcher. The mayor told Charles that he should have Alta join the team. Taken aback, Charles refused. The mayor wanted to prove to Charles that Alta did indeed have the skills it took to be on the semipro team and arranged a game. Alta struck out 15 men. Charles immediately signed her as the Independents’ starting pitcher. At the age of seventeen, Alta became a member of Ohio’s Vermilion Independents. Every weekend, she would travel almost 130 miles to Vermilion to play. On September 2, 1907, she made her pitching debut in front of over 1,200 fans. Alta pitched 5 innings and gave up only 4 hits and 1 run. Hailed as the “Girl Wonder”, Alta was a fan and newspaper favorite. So much so that special trains were commissioned to run from Cleveland to Vermilion so that people could see Alta in action. Usually, Alta would pitch the first five innings before moving to first base. It was estimated that over 13,000 fans came to watch her during her first season. When she played at Cleveland’s League Park on October 2, 1907, there was a season high audience of 3,182 and Alta led the Independents to victory against the Vacha All-Stars with a score of 7-6. 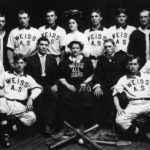 In 1908, Alta’s father bought a half interest in the team and renamed it “Weiss All-Stars.” She wore a black uniform while the male team players wore white uniforms. Alta also changed her previous uniform of long heavy shirts to bloomers. In an interview that year, she explained her change in attire: “I found out you can’t play ball in skirts. I tried. I wore a skirt over my bloomers and nearly broke my neck.” The Weiss All-Stars were based in Cleveland. She continued to draw large crowds during home games as well as away games throughout Ohio and Kentucky. 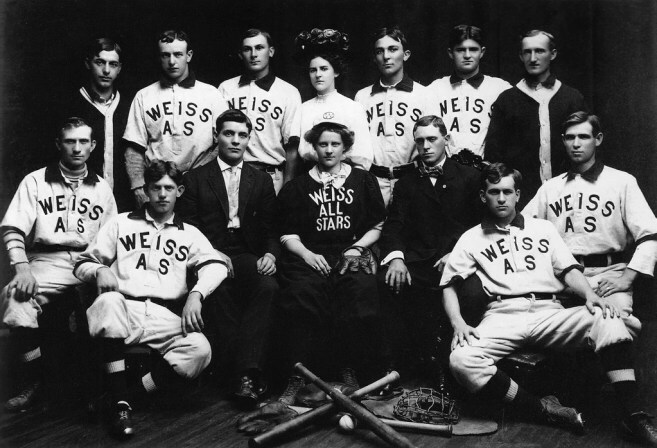 The 1908 Weiss All-Stars semipro players. Back (L-R): Roth (c), Grill (1b), Tischer (rf), Miss Irma Weiss (Alta’s sister), Meyer (lf), Murphy (c), Hobart (2b). Front: Hoffman (2b), Lehman (3b), Chas. Heidloff (mgr), Miss Alta Weiss (p), Ebner (ump), Langenhan (cf), Sonnendecker (ss). Absent: Reynolds (p), Zmich (p) and Winchester (c). While Alta was playing baseball, she was also following her father’s footsteps and studied medicine. She paid for school using the money she earned from playing ball. Alta graduated from the Starling-Ohio Medical School (a predecessor to the Ohio State University College of Medicine) in 1914. As with her baseball team, she was the only female in her class. Alta continued to play baseball for seventeen years until she hung up her uniform in 1922. After leaving the pitcher’s mound, Alta practiced medicine – first in Norfolk, Ohio before settling back in Ragersville. The Vermilion, Ohio website stated that, at one point, she “owned 10 cats, drove a 1940 Buick for decades, and read no less than 3 newspapers daily.” Alta also enjoyed watching the town youngsters play ball. She passed away on February 12, 1964 (three days after her 74th birthday). Alta’s trailblazing role in baseball paved the way for other female players. She played her first game thirty-six years before the famed All-American Girls Professional Baseball League was created due to the mass player shortage during World War II. Alta’s skills with a baseball proved that an unexpected person can have remarkable talents.